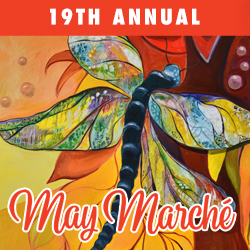 What Can We Say, It’s The May Marche! Enjoy food-tasting from some of the area’s finest restaurants, spirit samplings from a wide variety of vendors and some fabulous Silent Auction opportunities! Past restaurants have included; Deerhurst Resort, Grandview, Spencer’s Tall Trees, 3 Guys And A Stove, Bartlett Lodge and Hidden Valley Resort among others!